Imagine travelling from Los Angeles to San Francisco - a distance of 400 miles - in under half an hour and for free. Well, that’s exactly what a new transportation system envisioned by Elon Musk, CIO of Tesla Motors and SpaceX, sets out to do. 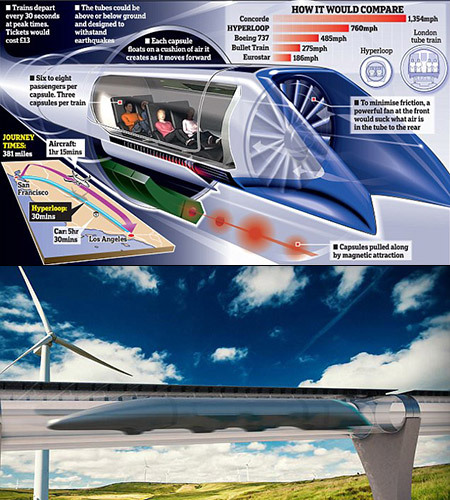 The ambitious Hyperloop idea, first officially revealed in a whitepaper published in 2013, is being built by Dirk Ahlborn, CEO of the Hyperloop Transportation Technologies,Inc. Less than two years later, SpaceX builds a 1-3 miles long Hyperloop test track outside its Hawthorne, California headquarters with plans to test the technology within a year. Next step: Collect ideas for pod design in the Open Competition, hosted by SpaceX. Ahlborn put together the team of around 360 professionals who applied for the right to work on the project and nearly all of them have day jobs at the companies like NASA, Yahoo!, Boeng, Airbus, Salesforce and Stanford. They’ve been attracted with stock options in the company and by the importance of the project. The major hype around this idea to actually shoot out people through tubes close to the speed of sound attracted over 10,000 people from academia and engineering who contribute their ideas daily to help Hyperloop become a reality. Whether you are a believer or a skeptic, there is now a quite good chance that affordable or even free superfast transportation may become our reality in the coming decade. Hyperloop will consist of the two parallel tubes standing on pylons with vacuum through which capsules with passengers will be propelled to the desired destination at the top speed of 1200 km/h. Ahlborn says the questions of how to build the low-pressure tube and the pylons that support it have mostly been solved, and creating the capsules shouldn’t be too tricky. So a lot of the technical and feasibility issues people were debating are solved. There are many more to resolve ahead, for sure. The biggest issues are speed and scale. They need more ideas to piece together the big Hyperloop puzzle and in the spirit of the true open source project SpaceX launched the Official SpaceX Hyperloop Pod Competition to get to the best Pod’s design and prototype faster. The challenge is aimed at students and independent engineering teams and will be hosted at the SpaceX headquarters in Hawthorne, California next June. Groups that want to join in will have to do so by September 2015, with the first “design weekend” being held in January 2016. The finished race will be held in June 2016. Companies will also be able to attend the contest to see what teams they might be interested in sponsoring. If you have any idea on how to create or design pods that can carry people through the tube at the speed of 200 mph, you might get a job! You have a better design idea for future trains? Join the Competition. No word on prize at the moment. Full rules and other details of the SpaceX competition will be released in August. Next January, entrants will meet for a design weekend at the Texas A&M University. The designs will be presented before an evaluation panel composed mainly of engineers from SpaceX and Musk’s luxury electric-car company, Tesla Motors, and university professors. Private companies will be able to use the weekend to choose teams to sponsor and fund. SpaceX said it also probably will build its own pod for demonstration purposes, but its team won’t be eligible to win the competition. The company also will have the final say on who actually gets to use the test track. How will they effectively manage the response from all who accept this challenge? The answer may lie in software solutions such as: Innovation Cloud and DataStation. Innovation Cloud is free idea management online software that might be just what SpaceX needs to host this challenge competition. Musk and Ahlborn leverage crowdsource, crowdfunding and open innovation principles to bring as many minds a possible to sort and answer the myriad of the questions coming with this ambitious idea. As the leaders, they both have enough experience, belief and persistence to drive this to execution. And deep pockets of the many investors. So step up, join his team and create something of meaning, or continue working on your next big app or operating system. I solved unified theory, Shapes, colors, pressures, 2547 spaces for gravity to occupy of either a shape, color, or pressure. : I also have plans for a starship, 20 min flights. One occupant. What's real, did I die and I can build a starship and fly back to earth where people would really listen to me? This is for you consideration, (space X ) saving more fuel or travelling further in to space. The lowest gravity on Earth. Location as for Sir Arthur Charles Clarke is in Sri Lanka ( South of the country ) Its mostly into the sea. I hope it will be useful. Thank you. hello Elon. my name is Vinesh. you have space travel wrong. I have the solution for interstella travel. the solution is here on earth. ask me how. New method for using electricity that will fundamentally change the way we understand how electricity works and can be used in our machines. Retrofit Tesla would quadruple the number of miles it can travel on a charge. Solar systems would NEVER run out of power regardless of weather or limited sunlight. Working prototypes demonstrate what is possible, and can be scaled up. I am contacting as many companies as possible and looking for ONE company to work with. We have NO patent and want to sell our IP. I think that in mars mission of spacex , spacex should not land the whole ship on mars rather it should fixed its main ship in mars orbit and release small capsule like ships to mars surface. I have the answer to the problem. I don't exactly know how to design properly but I know how to make it work. Launch willing subjects in cryogenic tubes with enough escape velocity to go somewhere.... for science! I'm talking maybe 50 subjects or so aimed at something within the scope of a desirable target, not just random space. I mean, worst case scenario all 50 subjects eventually collide with something or other, go on into infinity and the outer reaches of the galaxy, or destabilize and become space dust. Who knows? Maybe someone or something will discover them. 7 billion people on the earth. 50 subject's wouldn't be so bad. For science! The perfect gene. You know, like the DNA of Leeloo in The Fifth Element. Who needs to launch 200+/- lbs + the weight of cryogenic fluid into space. How about a series of "Voyager" missions that contain the digital and fabricated genetic code for the entire human race? Worst case scenario, they get hit by asteroids. Best case scenario, someone on the receiving end manufactures our species. Worst case scenario, intergallactic artificial human trafficking. Best case scenario, we make new friends. Myself Mr. Nachiket R. Bhurke from kolhapur invented the new magnetic frictional power technology. By using that technology the batteries in moving vehicles on roads will get recharged without any external resource. I’m quite confident that my invention will prove revolutionary in sectors like non conventional power generation.The invented technology will be helpful in research of cause behind the rotational motion of celestial bodies, light traveling speed. I would like to request you for a personal meeting to explain the details of my invention at a convenient time. This is a response to the article “Elon Musk has an idea for saving boys stranded in a Thailand cave”. I’m a Mechanical engineer, retire from Boeing Company! If you could pass on the following it would be greatly appreciated. Mini Flexible Sub If the children were individually put into an enclosed cylindrical rubber tube large enough for them and small enough to get through the small cave openings that would eliminate the need for a novice using a scuba mouthpiece and all the complexities that go with Cave Diving. It would be propelled by a rope and guided by divers. If it needed to bend around corners it would have to be designed to be neutral pressurized so that it stayed limp. Now an air scrubber would be needed for oxygen. If it did not need to be limp then air could added/(bled out) from a SCUBA tank. The mini flexible sub could have a communication component. If a child couldn't handle the confinement then he could be given a strong anti-anxiety drug and wake up in mom's arms! I don't believe the thickness of steel will exclude atmospheric pressure from the track. It certainly will colapse. Perhaps instead of traveling within a vacuum, leave the track partially pressurized, and use large turbines at each station to move the atmosphere within the track thus propelling the capsules. Just a theory, not sure if there would be positive gains at all, at any vacuum, given the length of pipeline and pressure loss due to friction. I have an innovation that could solve the problem of batteries heating up. This same technology could be used to greatly reduce the heat and stacking issues with nano technology. If you are interested in this innovation please contact me. Thank you. You don't need to create a vaccuum through out the whole tunnel. Compressed compartments like "air locks" or "Vaccuum looks" will do just fine. But another question came to mind today. I think we need to facilitate handicaped and old people using a permobile to access the nature here on earth. I saw an old lady sittning in here permobile just looking at a medow today. There were a path down to the ocean that she could not take. Constraint to the gravel path layed out. We need to make permobiles more like JEEPs or SUVs. So that Everbody can enjoy Nature on our planet. I've not to say anything here, I've sent the Ideas to Musk on e-mail... please refer to there. Those ideas are something to be kept Personal. Tesla cars and hyper loop are cool but you should move into high gear and create a new form of transportation: how about making this famous star wars vehicule a reality?? check it out the ''sith speeder'' http://starwars.wikia.com/wiki/File:Sith_Speeder_Tatooine.png. this will be a instant success. I suggest drone propellers or jet engine. I was under the impression that Hyper-loop was going to use superconductive magnets to suspend the vehicle in pressurized tube? I just watched an interview with Musky, I'm not to sure if i misunderstood, or not. It sounded like hyper-loop was going to use jets of air like a air hockey table, is this not a lot more prone to failure? I mean, I had figured the jet was going to be used to change the pressure on either side of the pod, pushing it along like a spitball in a straw, while the magnets kept it inline. In any case I'm very interested to see the outcome, you guys area tribute to are species. Cheers P.S I'm super stoked for BFR as well. Hi Elon, I have a solution to the auto mass production line. Could you create a personel sized drone with piviting arms to function as a car, or even motorcycle? How to solve the flooding in the midwest and the draught in the west. Simply build a water pipeline from the Mississippi to the Colorado River. Elon; assume someone is working on this already, but Mars landing prep should include locating underground water bodies, stocking them with something hardy like lobsters and some smaller creatures they can eat and preparing a food source for first colonists! First food cycle established ahead of human arrival. Hello to Uzbekistan,perrpettual mobile invention of Akmal Kiyamov ! Look at www.youtube.com video "Future energy invention"
Wireless chargeable cars like phones . I tried to give an organic pesticide/fungicide to the EPA to help change the world but they say it's not safe because it has hemp oil in it, can you help? This could help the whole world not have to eat poison soaked foods. I have an idea on how to stop worldwide forest fires, was looking for someone to share my idea with and possibly get it going! I had almost an identical idea about the "train in a tube" years ago. My plan, however, included a propulsion technique that would utilize a vacuum pressure created in front of the train by using a turbine to draw out the air, and pressurize the tube at the rear of the train using another turbine. Assuming the rail is mag-lev, the train will be forced forward by the air pressure pushing on the rear of the train. The centre of the train would have to be equipped with a ring that almost touches the inner walls of the tube, so as to keep the vacuum area separate from the pressurized area. The vacuum would eliminate air friction resistance as well, so the top speed of the train would not be affected by air resistance. I suggest refitting the fairings for the F9 as as wingless lifting bodies like the NASA M2-F1 and bringing them into a controlled landing remotely. I have an idea that can save 33 percent of the rocket fuel weight. How do I submit it to Elon Musk or spaceX? Are there any sensible far reaching proposals/ ideas from The Musk camp centred on saving our kind from global warming, aside from cars that use batteries? I had an idea for improving/making the Chicago tunnel feasible/possible. It would involve 1 pc Tesla Car, 2pcs PTFE Teflon Rods possibly with Iron core for strength. Mount the Rods on a reverse hydraulic sled enabling the rods to retract and engage at will, place one in the front beneath the car between the front wheels, and one rod in the back between the rear wheels. The tunnel base/track should be constructed similar to a Electric Race Track enabling the Teflon rods to function as a guide tour, keeping the vehicle on track and preventing accidental wheel turns (might be possible through AI and Software to follow the track and guide the wheels on Autopilot). (The Race Track grid in the tunnel base could be used to charge the car as well, add some imagination and some steel wool on the left and right side of each rod.) Now we have a guided track and need to create some high speed propulsion without depleting the car battery... So, why not create a intense static charge in the tube.. we are currently in a tube, so let's coat the entire tube with PVC fibre glass, this material is great at creating and maintaining a electrostatic charge. To make the static charge, imagine a circular track running vertical inside of the tube. Inside of the track we have pipes coming out using Maglev (think railgun) as propulsion, these pipes are equipped with either cotton strips or plastic feathers, similar to that of a Gala No Dust Broom, Now, moving at very high speed, touching the sealing of the tube, going around in circles at very high speed, these plastic feathers would create massive static while grinding against the PVC material meanwhile the now electrostatic pipe cause the aluminium body of the car to accelerate forward. However! Air friction would slow down the movement/maximum velocity of the vehicle; and by increasing the air temperature inside of the tube this would allow for lest friction due to the rising of hot air, so by making the "racing tracks" out of high carbon steel; the friction between the Teflon rods and the high carbon steel track could cause flash temperatures reaching up to 1000 °C while moving at high velocity, of cause the heating element would only benefit those arriving after the first car as heat would build over time, if the pipeline is not used for a extend of time, the air cools down and cause more friction for the next traveller. The waste heat from the carbon steel tracks could be picked up by thermoelectric generators installed beneath the tracks. On next traveller arrival, we reverse the current and heat up the tracks using current previously generated from the TEGs. Good Morning, I lived in Europe for many years and I would like to know if there ever been conducted a study on create an hybrid electric passenger train which runs with tesla batteries technology and regular electric grid power. In Europe all passenger railroad are electrified already and just curiosity if Tesla Company would like to diversify its products in that sector for the UE market. HELLO. You think about taking tourists into space, why do not you send all the rubbish into space (make room for a space station with a power plant outside Earth); another is - make a chimney between the atmosphere and outherspace for carbon monoxide to get rid of it (the first and second can be combined). and last - help people here - autorobotics are in progress, we all lose our job for robots, but we can be the owners of these robots and help small businesses compete with giants who do not care. I understand that these are expensive ideas, but only the rich can start them. It's not the time to think about electric cars when the world dies ... Good luck. DEAR MR. ELON MUSK! RUSSIAN NANO LABORATORY PROPOSES YOU FOR COOPERATION IN IMPLEMENTING FUTURE PROJECTS FOR WORLD CIVILIZATION. ALL PROJECTS ARE IN THE STAGE OF COMPLETION WE OFFER YOU TO BECOME OUR PARTNERS IN CREATING INDUSTRIAL PROTOTYPES AND IN FUTURE INDUSTRIAL IMPLEMENTATION OF THESE DECISIONS THE EXPECTED PROFITABILITY OF EACH OF THE PROJECTS IS 10 TO THE 17TH DEGREE EURO IN THE NEXT 10 YEARS THE FIRST PROJECT ELECTROMAGNETIC SOURCE-ENGINE (ESE) OPERATING WITHOUT FUEL AND WITHOUT STOPPING We propose to complete jointly and introduce the development of an electromagnetic source-engine (ESE). ESE extracts energy directly from the substructure of the ether, which is an infinite crystal-like matrix made up of cyclic packets of standing waves. ESE produces any given, never ceasing power-traction. Turns on once and for all (warranty period of work - 10 000 years). The cost of 1 kW of non-stop power is 1-10 EURO. The working body of the source-engine 1 kW of non-stop power-tracrion has an average size of 5 mm. ESE does not require fuel and input power, and therefore - electricity, mining and transportation of fuel, transport infrastructure and the like. ESE completely solves the issues of providing the Earth with an unlimited flow of energy, food, living conditions for any climatic zones, ocean depth, underground space, unlimited transportation and unlimited free movement, as well as complete purification of the Earth from all types of impurities and toxic wastes. THE FIRST PROJECT - IN MORE DETAIL Electromagnetic source-engine has been developed by the Nanoworld Labboratory since 1989. Electromagnetic source-engine works non-stop, unlimited time, without fuel or input power, turns on at the same time. Today’s name for ESE is "EmDrive". However, no one in the world understands why the electromagnetic source is the lectromagnetic engine and how it can be. By 2019, we developed several series of several generations of ESE ("EmDrive") - for various ways to turn on and apply. The final stage of our work is the identification and debugging of switching on modes of non-stop generation-traction. Modes of the source-engine can be activated independently, or combined modes are possible . The cost of source-engine is 1-10 EVRO per 1 kW of non-stop power-traction. On the basis of the electromagnetic source-engine, it is possible to produce non-fuel flying suits, non-fuel flying buildings, non-fuel flying vehicles - airplanes - rockets - non-fuel transport - ground - air - ocean - space, non-fuel aircraft platforms for super high-speed construction on the ground, devices for atomic gold and rare elements production (without mining ore works and chemical processing of ore) in the amount of millions of tons per year, laser and other tools for cutting, softening and molding rocks and many other tools of the latest generation of technology. The earliest known analogue of the electromagnetic source-engine was declared in the USSR in 1973 and was awarded the Medal of the World Exhibition in Europe in 1993. Today, some electromagnetic engine solutions are constructed with the lowest power and thrust. They are c called "EmDrive" and tested in NASA and CAST in orbit of the Earth. In reality, there is no need to put ESE ("EmDrive") into orbit, since it is switched on by an electromagnetic pulse or a blow (if a ferroelectric or piezoelectric is included in the working body), instantly starts from any place and then works without fuel consumption or input power The essence of EmDrive is the energy source-engine (in short, the source-engine). The source-engine in the inclusion phase causes vibration in the crystal-like substructure of the ether, which in the working phase leads to the emission of electromagnetic energy from the substructure of the ether, which we use for our needs and for traction. Ether is modeled in the 19th century by JK Maxwell. It is on the basis of the ethereal paradigm that JK Maxwell developed electrodynamics, which is adequate and relevant at present. The crystal-like structure of the ether, composed of standing waves, is consistent with the latest theories of solitons, with the theory of automatic control and other latest developments. These theories and experimental data allow us to model, describe, explain the work, research experimentally, calculate and execute the latest highly maneuverable and powerful engineering implementations of ESE ("EmDrive"), with any necessary power and thrust. The largest scientific centers of the world that do not have a modern working scientific model of the ether (NASA, CAST and the like), in our opinion, can neither explain the mechanisms of action, nor accurately predict, calculate and implement the parameters of working devices. We know how to do it. We CAN turn on a number of source-engine implementations in the near future, as well as create a number of technologies of the latest generation or their basis. THE SECOND PROJECT 3D GENETIC CODE We propose to jointly complete and implement the development of an international service to accurately determine the spatial structures of protein molecules. We discovered and substantiated that the spatial model of a protein is determined by its nucleotide sequence. Today, accurate modeling of protein structures is the most urgent and not satisfied until now need of all without exception specialized and related laboratories of the world in the field of pharmacology, medicine, bioengineering, all other areas of basic and applied research. At present, protein structures are determined by X-ray structural analysis, which is inaccurate, uninformative, long to implement and costly. Also, the method of X-ray structural analysis is suitable only for 3% of proteins. Daily ordered from 60 structures of 10 000 Euro on average. Our method is suitable for almost all studied and unexplored proteins and, in contrast to X-ray structural analysis, does not require high costs in the execution of orders, and also has high execution speed, accuracy and information content. THE THIRD PROJECT REJUVENATION AND UNLIMITED LIFE EXTENSION We propose to jointly complete and implement the development of creating a means for returning the body to a young age and the subsequent unlimited extension of life. The laboratory mouse, which was injected with the blood of pregnant mice, remained young and did not grow old while the injections continued — exceeding the life expectancy by one and a half times. The aging stop signal produces an embryo (embryo) of pregnant mice - in the form of a group of immortaline hormones. Having isolated these hormones, we can produce them industrially and introduce them to people daily, rejuvenating them and indefinitely prolonging the youth of humanity. THE THIRD PROJECT - IN MORE DETAIL It has been experimentally proven that the embryo produces a signal (mRNA packed in exosomes), which enters the hypothalamus of the expectant mother through the blood. As a result, the body returns to reproductive biological age for the duration of the signal. If the signal is repeated daily, then the body can be in reproductive biological age indefinitely. Embryo hormones form a group of immortalins that disable phenoptosis (programmed death). This is a group of about 14 hormones. We need to know their codes. One of these hormones is detected by us. This is an analogue of hypothalamic somatostatin, which replaces hypothalamic somatostatin in the body, but is a “dummy”, i.e. does not inhibit the production of growth hormone - somatotropin. As a result, the regeneration of tissues, in particular, muscle tissue, is resumed, and the musculature of older women becomes again like that of young women. The remaining approximately 13 hormones, immortalins, we also have to determine. Elon, your looking for the cheapest and most safety conscious method to colonize mars ? Why not design a horizontal landing tunnel borer ? First you need an on demand power source. With it you can colonize the Moon and Mars. Having such a power source would reduce our dependence on oil by 47%. Unfortunately it would also make solar and wind power completely obsolete. Batteries would be a thing of the past also. Don't worry, Its Coming.....Longevity testing is to begin this summer. All terrian imaginable Earth vehicle. I have an idea don't know how to go about it but it is somthing that will be a game changer and also trend as well. FREE BEER! Now that I have your attention I have a proposal on how to obtain said free beer. There is a cloud of alcohol (ethyl alcohol – the happy juice found in beer, wine, and spirits) floating in space. This isn’t a small cloud either. There is enough alcohol in this cloud to make 400 trillion pints of beer. That is one hell of a keg party. The bad news is it is 10,000 light years away in the constellation of Aquila. It’s unlikely we could get to the cloud any time soon. However it is not impossible. The booze cloud, known as G34.3, is so large (1000 times the size of our solar system) our solar system could drown itself inside many times over. A collection of alcohol of this magnitude would make Elon Musk the indefinite king of the party. For The Attention of Elron. Congratulations on the splash down! I have an idea for a system to land the nose cones of your rockets autonomous. I would be in having a chat with your R & D team. Best regards John Hill. A large space-station skeleton, consisting out of a one launch multi interconnected container like structures (30 folded units! ), that do deploy automatically on command, in any direction. Further, do accommodate it with additional dedicated launches, into docking bay(s), power station (sun collectors), observatory, labs, personnel chambers, etc... Together; build your space village(s)! Available copyrighted drawings and 3D available design. Mr. Musk I want to told you that about my future spaceship (UFO ) project . I made a High tech formula for future spaceship .this spaceship is very powerful then to other rocket spaceship because its run by only natural gas and can't to be used any liquid , and fuel . This spaceship is pollution free because it's a high technical engine spaceship and I used my best formula for planets gravity . And other information is this spaceship is world's first fastest spaceship .